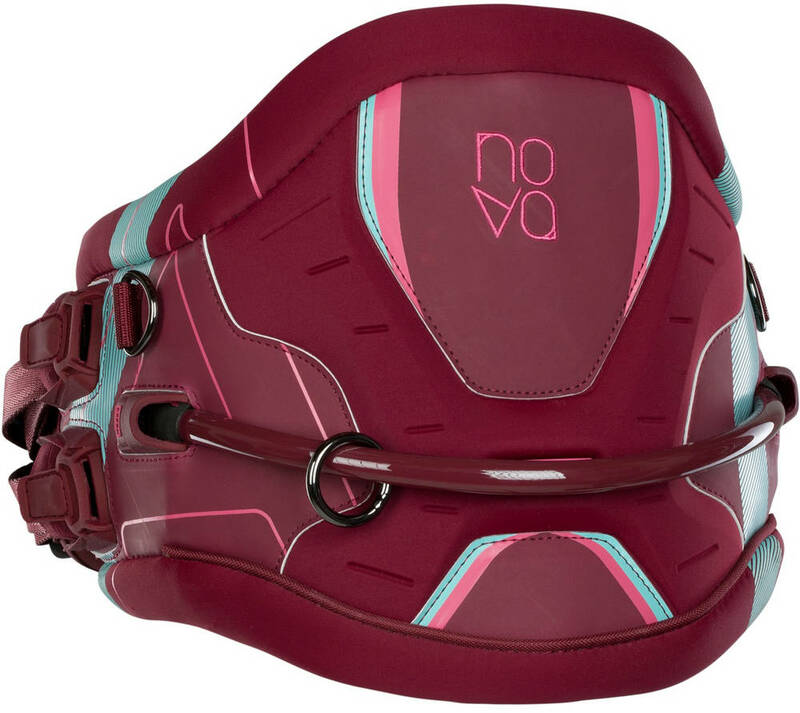 The Ion Nova waist kitesurfing harness for women is aiming for freeride, wave and freestyle kitesurfers. The design with EVA foam, x-shaped internal support and soft-edged makes the harness a great kitesurf gear with enhanced control, comfort and flexibility. The Nova comes with the Ion C-bar technology. With the C-bar technology, the spreader bar is made, not of metal, but of reinforced injected fibres that makes it very lightweight. The spreader has a tension lever system that easily tightens the harness to a good snug fit. The construction is optimise comfort via internal EVA. EVA thermo moulded insert x-shaped for optimised protection of the back still making the harness flexible for good and free feel of movement. The edge around the harness is made with extra soft neoprene and enhanced by a special foam to optimise the comfortable feel of wearing it. The Soft Edge bends sideways at the hips and ribs to make it more comfortable. To make the harness wrap even more perfectly around the body the Split Edge, which is a divided buckle plate, makes it stay closer to the body and makes comfort and power transfer superb. Slim handle on the back with integrated stainless steel ring to connect the handle pass leash. Pockets that cover and protects the buckles with a rubber patch. Easy storage of the webbing. If in trouble it's always great to have a kite knife to cut the lines. This harness has a kite knife integrated. These seams ensures smooth transition from the mid section of the harness to the neoprene soft edges. The Bar Keeper Belt is connected to the lower part of the harness. Connected to the spreader bar this ensures that the spreader bar stays in low position. This harness is pre-moulded to ensure great fit and support.